We often forget the unsung hero of our social media posts, the URL. We put so much effort into creating great content, with nary a thought to this little string of characters. But it can be crucial to its success when you use the right URL shortener. In this post we’re going to talk about what are URL shorteners, why you should use them, and answer some frequently asked questions about shortened URLs. 1. bit.ly is a URL shortening service that offers tracking metrics so you know exactly how many people are clicking on your link. Something to keep in mind though is that bit.ly tracks all clicks, even non-human clicks. It’s a free service where you can share links directly from their site to your Twitter profile. 2. goo.gl is Google’s official URL shortener. You don’t need to create an account, it’s Free, and it offers you data on how many times your link has been clicked. You can go back to the site whenever you need to gather information on your links. 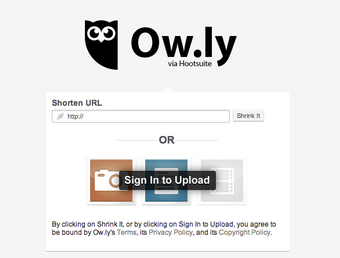 3. ow.ly is Hootsuite’s built in URL shortener that you can access via your Hootsuite dashboard or on the ow.ly site. This link shortener allows you to upload images, track real-time clicks that doesn’t include clicks from bots, and you have the ability to post it to your various social networks like Facebook, LinkedIn, Twitter, and Google+. You can also use the shortened URL in emails or on your website and use Hootsuite’s URL click stats to track how many clicks those links receive. Why you should use a URL shortener? The main reason why you should use URL shorteners is to be provided with the data on how people behave when they are faced with your shortened URL. If you post a long URL you won’t be able to track real-time engagement with it or clicks, but when you shorten a URL you’ll be able to track click-through rates and even track where they are clicking from. For example, the Ow.ly URL shortener serves an important purpose: tracking how many people click your links receive. With the Ow.ly tool you can see a quick snapshot of the number of clicks on any link you shortened within Hootsuite, insight that you can use to determine what Tweets and posts resonate most with your followers. If 800 people click on a URL in a funny Tweet promoting your new shopping app but only 200 people click on a URL in a more serious Tweet, this knowledge can be applied in future posts. In other words, URL click data can be used to increase the chances of your followers clicking a link. 1. Why do I need to shorten my url? 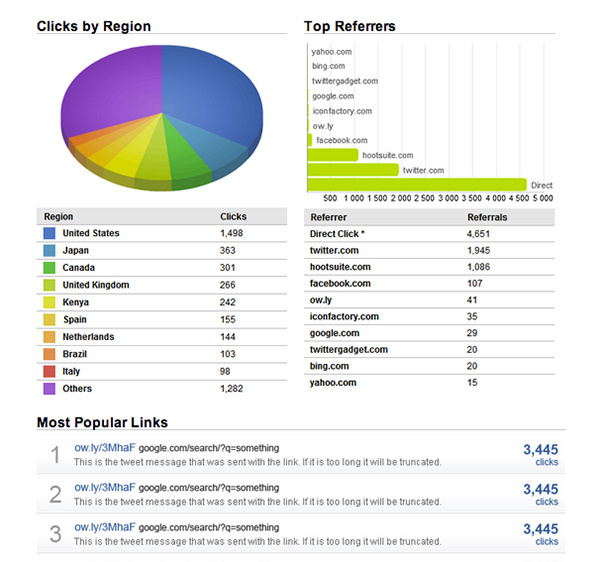 It allows you to track and measure how many clicks you receive on a URL. A lot of businesses use URL shorteners so they can see how well a post is performing based on how many clicks the URL in the post received. 2. Are shortened URLs only for Twitter? No, they are not. You can use shortened URLs on any social network and even in emails or on your website. As long as you have the proper social media analytics tools to measure the performance of your shortened URLs, then you can use them on any of your online assets. 3. What’s the difference between Hootsuite’s URL shorteners? 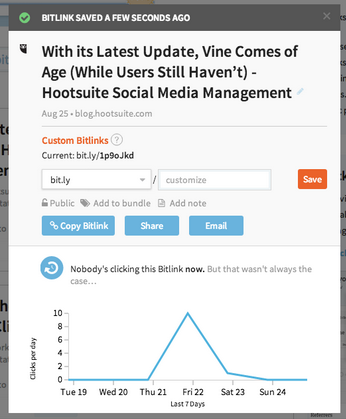 The Hootsuite dashboard offers four URL shorteners: ow.ly, owl.li, ht.ly, and htl.li. Each URL shortener ends with the country where the domain name is registered (.li is for Liechtenstein and .ly is for Libya). This means the difference between ow.ly and owl.li, for example, is simply where the server is located. Otherwise, both URL shorteners can be used interchangeably. However, ht.ly and htl.li include the same ability to track click stats as ow.ly and owl.li, but are also equiped with Hootsuite’s Social Sharing Bar. The Social Sharing Bar displays at the top of the image or web page, and encourages users to rate and re-share content. 4. What are Vanity or Branded URLs? A vanity URL is a web address that is branded for marketing purposes. They are a custom branded URL that replaces one of the above URL shorteners listed above and uses your company’s branding. They provide the same information as a shortened URL, but instead of showing up as ow.ly or a bit.ly, it could show up looking like Time Inc.’s vanity URL “ti.me”. They are one of the many organizations making use of vanity URLs. Shorten your URLs before you share them across your social networks using Hootsuite’s URL shortener. Try it free today.